What in the world is crafting on the go? No, we’re not talking about the latest web-enabled phone here. Instead, we’re talking about making the most use of all that down time when you’re away from home. Think about waiting in the car for the kids to get finished with soccer practice, sitting in the doctor’s office waiting because the doctor is just a bit behind, waiting for your car to get its 15-minute oil change. These are those down times that we all wish we could make better use of. When you go to visit with another of your crafty friends, wouldn’t you just love to share the joy of making projects together? Then it’s time to get a craft-on-the-go project. This is when you want a small project that doesn’t require too many tools or equipment. A project you can tuck into a mini-tote bag and carry with you every time you leave the house. Perfect examples include cross-stitch Christmas ornaments, bead stringing for necklaces or bracelets, and plastic needlepoint photo-frames. If you do hand stitching on quilts, try a mini-quilt project to take along. How about squares for an embroidered baby blanket? If you are a print artist, try designing little winter or holiday scenes and coloring them in with markers or colored pencils while you wait. The trick to crafting on the go is to find or create small things that can be worked without too much to carry along with you. Those things that you do carry need to be items that you can keep with your project in its mini-tote. In other words, you don’t need to pack them up every time you want to leave the house and unpack when you want to craft at home. We are not talking about that huge afghan blanket you have been crocheting. But, we are talking about Granny Squares or other squares that can later be stitched together to form a bigger blanket. A little tip here, coming from personal experience. If you are working on a part of a project, it might help to copy the instructions and add them into your tote bag. I have found that a little time lapse caused me to forget the stitch pattern I was working. Now, I keep a little instructions sheet tucked into my tote bag, just in case. 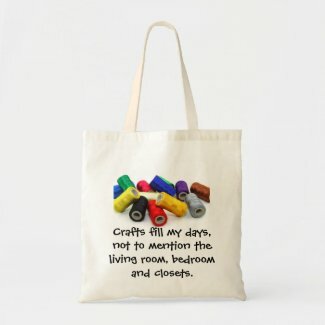 I find that for my crafting on the go, I like to have extra craft supplies ready. Just in case I run into a even longer wait than I expected. Craft kits in small sizes and perfect for crafting on the go are available in most craft supply stores. Some of my favorites are listed on Crafting on the Go Ideas. Don’t forget your little tote bag.